Kenapa orang yahudi pandai dan sihat? The negotiations and the negotiating texts (the documents that are used during the negotiations process) are secret, and all TPPA governments have agreed to continue the secrecy on the negotiating texts until four years after the deal has signed. This means that if they sign the deal by end-2013, the earliest that the citizens of the eleven countries whose government leaders are signing in their names can see how the negotiations were carried out is late 2017 or early 2018 (or if negotiations break down permanently). Would you allow such a document to be signed on your behalf? Wouldn’t you want to exercise your right to see the draft? To object to provisions you believe are objectionable? Or to reject the agreement altogether for being against your interests and welfare? There are proposals on the table to impose the Investor-to-State Dispute Settlement (ISDS) system, which will allow foreign investors to sue TPPA governments for any action—even action done to protect or promote public health, education, or the environment—if such action is seen as harming the investor’s rights. Many cases prove that this can—and has—happened: After Canada banned methylcyclopentadienyl manganese tricarbonyl (MMT) because of concerns about its dangers to public health, for example, the government was sued by the MMT manufacturer—Ethyl Corporation—at an international tribunal, and subsequently had to pay compensation to the company and reverse the ban. The largest award to date that is publicly known is against Ecuador for USD 2.4 billion! Furthermore, the investment chapter effectively empowers foreign corporations to ignore and override Malaysia’s domestic judicial, legal and parliamentary systems, its Federal Constitution and the unique and historical federal-state division of powers that Malaysia has developed over the decades. Other provisions could greatly restrict governments’ ability to balance the public interest and human rights against the private interests of corporations. About 80% of the medicines that Malaysians consume are generic medicines, which are generally much cheaper and thus more affordable than ‘original’, patented medicines. For example, in Malaysia, patented medicines can be 1,044% more expensive than their generic equivalents. Malaysia already provides adequate protection for pharmaceutical companies’ research and products, which it seeks to balance against the need for affordable access to medicine and medical treatment. -- EXPANSIVE PATENT PROTECTION for new forms, uses and methods of using known substances. These low patenting standards can extend pharmaceutical monopolies for minor variations on old products, including those that contribute nothing to efficacy. -- PATENT TERM EXTENSIONS that stretch the duration of a patent beyond 20 years. -- PATENT LINKAGE that prevents registration of generic medicines and facilitates abuse. -- ELIMINATING SAFEGUARDS against patent abuse, such as pre-grant opposition. -- BIASED PROCEDURAL REQUIREMENTS that presume challenged patents valid and measure damages by the patent holder’s assessment of value. -- DATA EXCLUSIVITY that prevents health authorities from relying on clinical trial data to register generic versions of medicines. -- BORDER MEASURES that could lead to unjustified seizures of generic medicines. In 2004, the monthly cost of treating HIV patients were reduced from RM1,200 per patient to only RM200-220, after generic medicines replaced patented ones. As a result, 4,000 patients could be treated compared to only 1,500 previously. With the TPPA, cheaper generic medicines could be under threat. The TPPA may extend the duration of copyright beyond the present 50 years after the death of the author (up to 120 years, if the US proposal is accepted). This would impact on library digitisation programmes, lead to removal of works already digitised from public access, restrict the re-use or use of out-of-copyright works; raise the prices of library materials; and lead to fewer purchase of works by libraries. It won’t be just libraries that are impacted, but also ordinary Malaysians and students, who want to photocopy a textbook, for example. The net result is that all Malaysian’s access to information and knowledge is affected, and there will be negative impacts on the research and education sectors. Internet Service Providers may be able to bar users from the Internet for violation of copyright. The TPPA negotiations are seeing proposals put on the table that will negatively affect affordable medical treatment, environmental conservation and the ability to regulate numerous other areas in the public interest, It will instead maximise private corporate rights and interest at our expense. Let’s stand in solidarity with other peoples and movements who are demanding that their rights to life, health, livelihood, equality, equity, food, environment, knowledge, traditional systems of life and livelihood not be jeopardized by the TPPA. Punca UMNO masih segar bernafas adalah kerana orang melayu ditakut-takutkan bahawa ketuanan melayu bakal lenyap ditangan Pakatan Rakyat. Seperti meankut-nakutkan anak-anak mereka jangan keluar atau buat bising diwaktu malam. 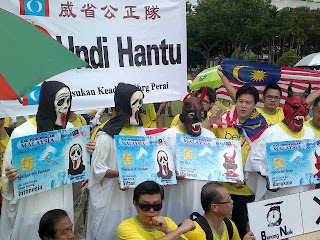 Anehnya mereka sendiri belum pernah berjumpa dengan hantu. Tapi mereka gemar menggunakan khidmat 'hantu' untuk kerja-kerja mereka.